The Time Bum is a big fan of Sujain Krishnan's Melbourne Watch Company. His previous products, the Flinders and the Hawthorne, both had solid specs and a traditional style that captured a certain elegant simplicity. It seems word has gotten out as the latest Melbourne watch, the Portsea, recently launched on Kickstarter and exceeded its $35,000 funding goal in the first day. 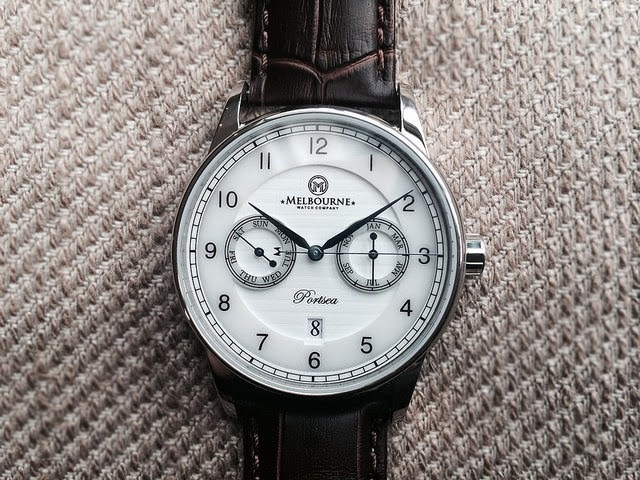 The Portsea is a dress watch in the marine chronometer style. These watches were originally used by sailors and are characterized by clean white dials and Arabic numerals. Sujain reinterpreted this classic with a triple calendar display featuring two sub dials for day and month, and a date window at 6 o'clock. 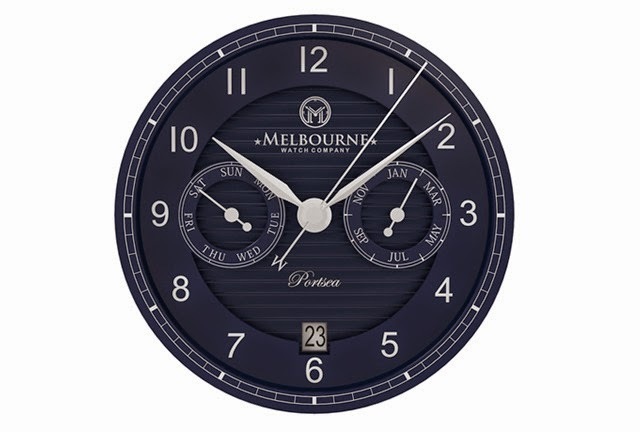 The numbers and sub dial rings are a ceramic overlay, "floating" above the center dial that bears the Melbourne brand, model name, and signature horizontal texture. The primary hands are a long and slender index style. Sub dials have batons with lollypop tails. 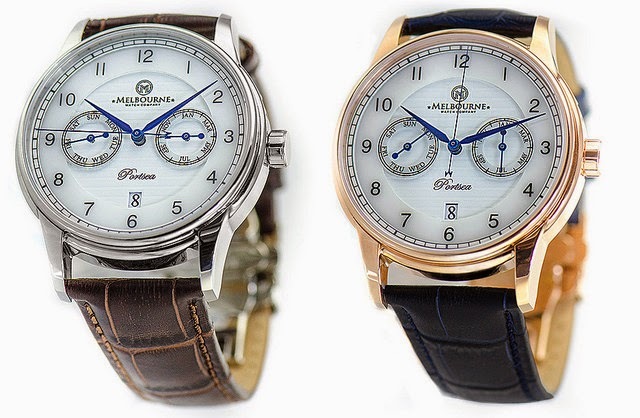 The second hand has the Melbourne "M." Dial choices are white with blue hands, or blue with silver hands. The movement is the new 26 jewel Miyota 9120, modified by Melbourne from a three register day/month/24 hour function with a 4-5 o'clock date window to the Portsea's triple-calendar display. Like its more common 9015 stablemate, the 9120 is a high beat automatic with hacking and hand winding capabilities, a 40 hour power reserve, and a smooth 28.8 bph. 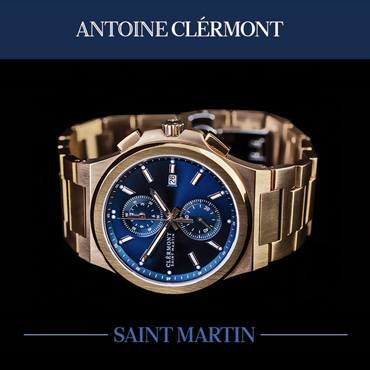 The case is 40mm wide, and 12.5mm thick, placing it comfortably in the range of the modern dress watch. Polished stainless steel is standard, and 50 rose gold plated cases will be offered. It has a flat sapphire crystal with anti reflective coating and is rated for an impressive 100 meters water resistance. 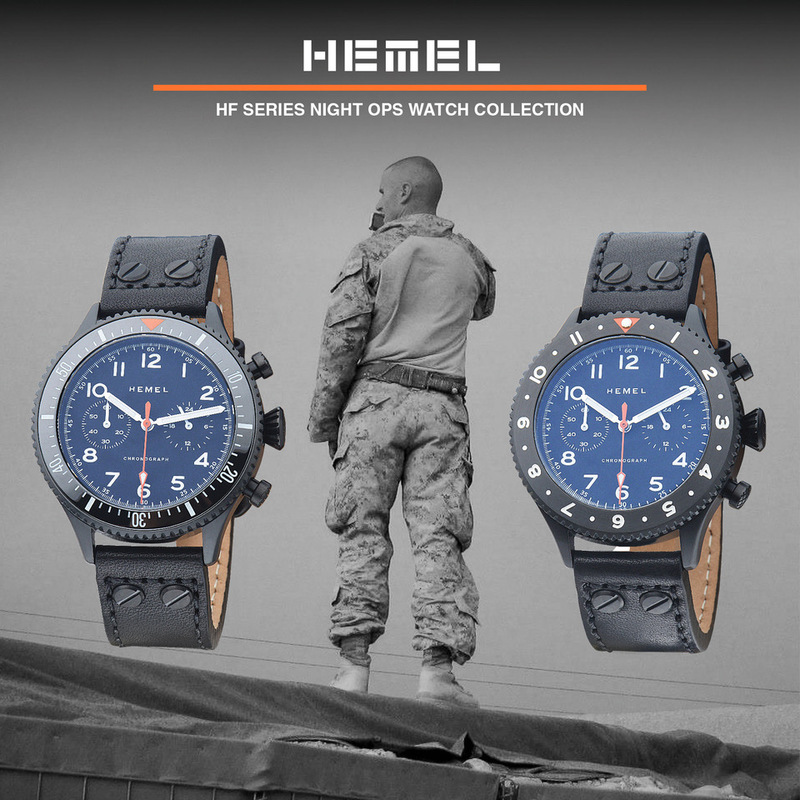 It will be supplied with two crocodile print leather straps in blue and brown. 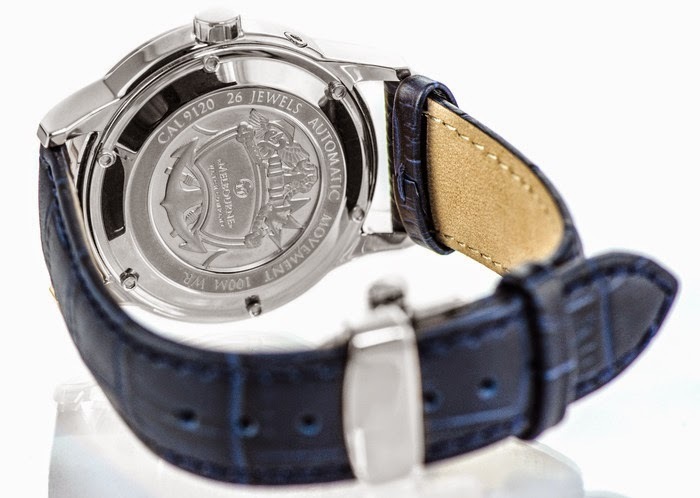 The case back is stamped with an intricate nautical design. 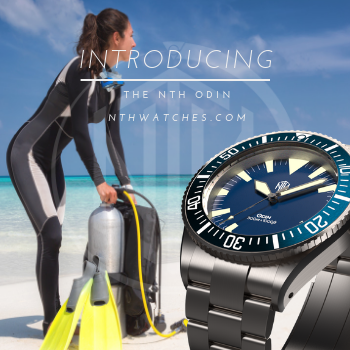 Only prototype images are available, but they show a truly stunning watch. Pre-production changes include taller spacers to increase the layering effect on the dial, a signed crown, larger "M" on the second hand tail, enhanced texturing on the bottom dial layer, and the elimination of the date window cutout in the upper ceramic layer. Sujain describes the watch as the next step in Melbourne's evolution, "a truly global timepiece with an Australian design, Japanese movement and parts sourced from around the world." 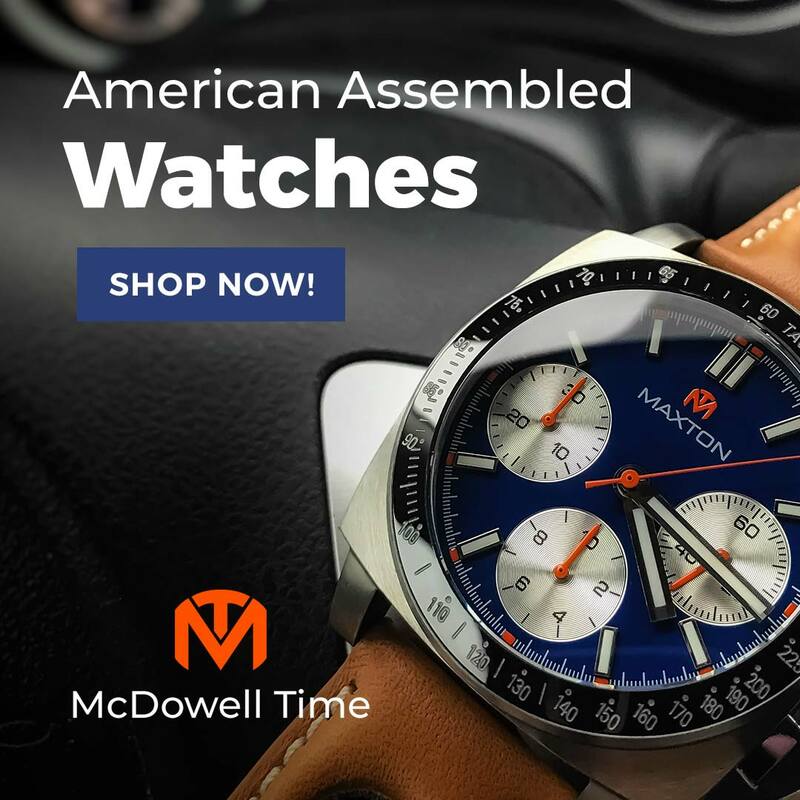 The watch looks gorgeous and while it costs more than the company's previous models, it is still an impressive bargain. Complex elements like the layered ceramic dial, modified high beat movement, and intricately stamped case back are quite unexpected in a watch with a $770 AUD (@ $720 USD) suggested retail price, let alone the Kickstarter prices. As of today, the lowest pre-order price is $595 AUD (@ $556 USD), and they are going fast.